Updates released today to the cloud-based practice management platform Rocket Matter add two notable features not previously available in the platform: a business intelligence module and customizable dashboards. Other enhancements include an improved contacts page and the ability to view documents stored in the application. Rocket Matter labels its releases using names from Game of Thrones, and it is calling this one Winterfell, the name of the large castle that is the ancestral home of House Stark. Founder and CEO told me yesterday he considers it a major upgrade to Rocket Matter’s core feature set. Port is an advocate of law firms using lean methodology adapted from the manufacturing world to become more efficient and more profitable. Last year, he co-authored the American Bar Association book, The Lean Law Firm, which describes the methodologies he advocates. Rocket Matter’s new business intelligence (BI) module allows firms to custom build a wide range of reports, in keeping with the lean methodology. 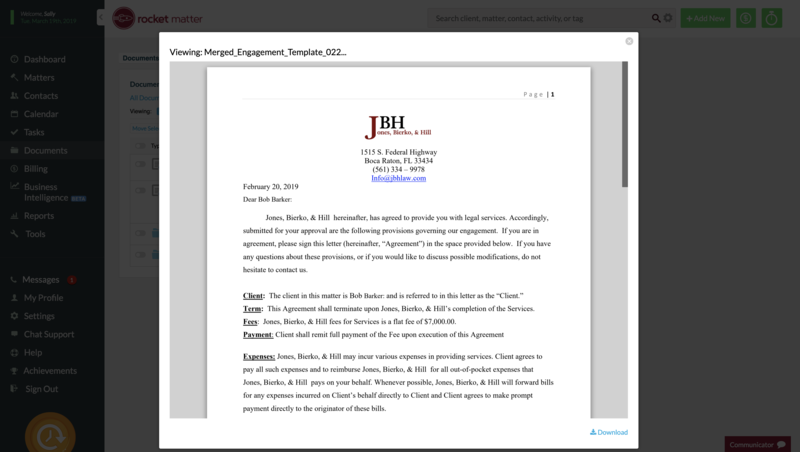 A drag-and-drop module (or, as Port jokes to extend the Game of Thrones metaphone, a “dragon drop” module) allows lawyers, law firm administrators and other users to design custom queries across matters, activities, contacts and billable information. To do this, a user goes to the report editor (see image above), where a list appears to the left of virtually every data field available within Rocket Matter (except custom fields). The user drags the desired fields to a Report Columns block in the editor to add them. A second block in the editor, Report Grouping, allows the user to group the report by particular individuals, such as lawyers or clients. A final block allows the user to apply filters, such as by dragging a “days since opened” field and setting a limiting range. A closer look at the report configuration options. In addition to all that, each of the drag-and-drop elements has a toggle built into it that allows the user to further customize how the data is displayed in the report. This can be used, for example, to show average aggregate values of pending amounts for a client across all matters. Once the user has finished editing the report, the user simply saves it to create the final report. The results can be viewed or edited within Rocket Matter, copied to create a new report, or exported to a spreadsheet. None of this replaces the templated reports that Rocket Matter already includes, covering a range of standard law firm metrics. A user can toggle dashboard widgets on or off. With today’s release, users can now customize matter dashboards to tailor the view to their liking. 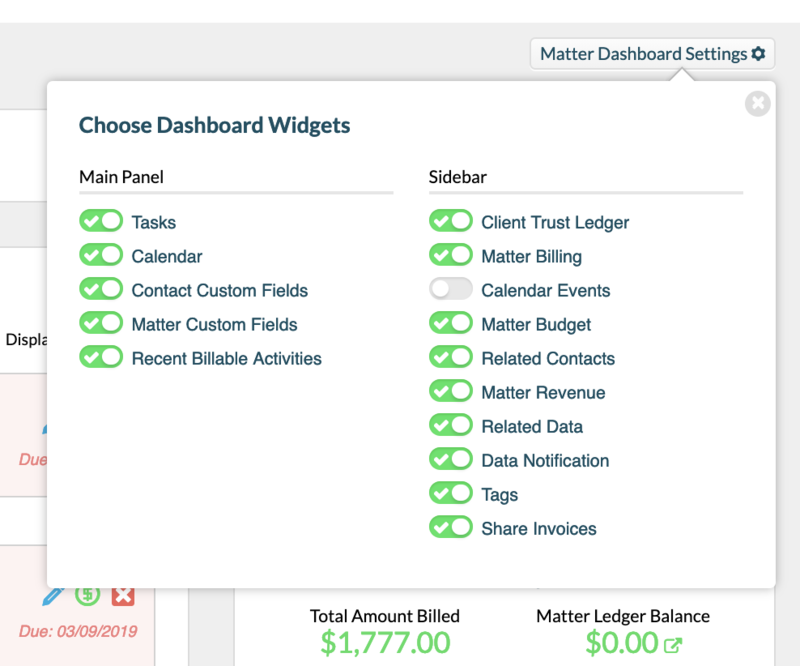 All of the elements shown on the dashboard — such as tasks, user billing, fee billing, etc. — are contained in widget blocks that the user can drag and drop to reorder them to wherever on the page they prefer. From the dashboard settings button, the user can also toggle the display of each widget on or off. Users can now preview documents within the platform. A redesign of the contacts page to add an endless scroll of all a user’s contacts on the left of the page, with each contact’s full details in the center of the page. A document preview function, allowing a user to preview a document stored in Rocket Matter without having to download it. Port said the release also includes speed and performance improvements across the platform.